WeSellHorseFarms.com Is the Premiere Website for Equestrian and Large Acreage Properties in Western Pennsylvania. To speak with an equine real estate specialist. Welcome to We Sell Horse Farms! It is designed to aid you as a buyer in finding the equine property for sale that is best suited for your equestrian needs. Many people are searching for large parcels of acreage for farming, hunting or recreation. We are constantly reviewing parcels that fit those descriptions. Call us to get our list of hot properties. If you are seeking residential listings in the Western PA area, we can help there as well. 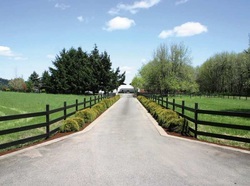 Ask about our pocket listings and confidential listings from small hobby farms to commercial equestrian facilities. If you are searching in the Western New York region, one of our team members is licensed in New York and would be glad to help you. If you are thinking of selling your horse facility then please take a look at the "Marketing Strategy" page to see why www.wesellhorsefarms.com is one of the best sources for giving your horse farm for sale the exposure it needs. It will help you see why the WeSellHorseFarms team is the best at what we do and why we sell horse farms better than anyone else. If you are looking to buy an equine farm or horse oriented property then take a look at our featured equestrian properties for sale. Our featured horse farms for sale have a vast range of prices. If you do not see an equestrian facility on our featured horse farms for sale pages, contact us about our list of equestrian properties being offered in the area.